The FIBARO Heat Controller is a remotely controlled thermostatic head to control temperature in your room. It measures the temperature and automatically adjust the heat level. It can be mounted without tools on three types of thermostatic radiator valves. You can create schedules via app to easily manage temperature throughout the week. Unconstrained rotation spherical knob to set desired temperature. Connect the charger to the micro-USB port to charge the device. Use a coin to open the battery cover by turning it counter-clockwise. Use a coin to close the battery cover by turning it clockwise. Disconnect the charger when the LED ring pulses green (device fully charged). First charging may take up to 3 hours. Dismount your current thermostatic head. If you use one of the adapters, double check that it is mounted properly. It should click when putting on the valve, hold tight after installing and not rotate! Install the device in horizontal position only! 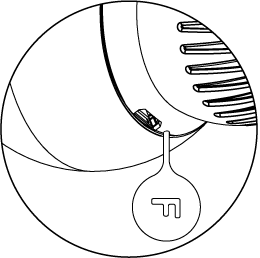 Mount the device on the valve and tighten it by turning the cap clockwise. Use the included key to click the button. The LED ring will start blinking blue. Click the button on it now. The LED ring will blink green 5 times if the connection was successful. Do not cover or veil the thermostatic head. Calibrating the device to your radiator valve is required for proper controlling the temperature. Calibration cannot be performed while the device is being charged. Manually, using the menu (see below). Use the included key to press and hold the button. Release the button when you see white LED colour. Click the button to confirm the selection. Before dismounting, the device must be put in Standby Mode to ensure safe removal. See „Standby Mode” for more information. Release the button when you see cyan LED colour. 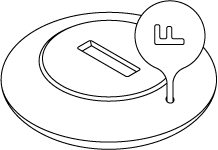 Turn the cap counter-clockwise and remove adapter if used. Store the device in temperature: -10°C to 25°C. Make sure the device is within the direct range of your Z-Wave controller. Use the included key to quickly triple click the button on the thermostatic head. The LED ring will start blinking white. If you are adding in S2 authenticated mode, type in the device pin code (underlined part of the public key on the label). Successful adding will be confirmed by the Z-Wave controller. Successful removing will be confirmed by the Z-Wave controller. Release the button when you see magenta LED colour. Pulsing green – the device attempts to establish a direct communication with the main controller. If a direct communication attempt fails, the device will try to establish a routed communication, through other modules, which will be signaled by visual indicator pulsing yellow. Glowing green – the device communicates with the main controller directly. Pulsing yellow – the device tries to establish a routed communication with the main controller through other modules (repeaters). Glowing yellow – the device communicates with the main controller through the other modules. After 2 seconds the device will retry to establish a direct communication with the main controller, which will be signaled with visual indicator pulsing green. Pulsing magenta – the device does communicate at the maximum distance of the Z-Wave network. If connection proves successful it will be confirmed with a yellow glow. It’s not recommended to use the device at the range limit. Glowing red – the device is not able to connect to the main controller directly or through another Z-Wave network device (repeater). The device can be used with an additional, dedicated temperature sensor (FGBRS-001) to provide the best temperature regulation. It can be placed anywhere in the room and the device will use it as a reference point for the room temperature. 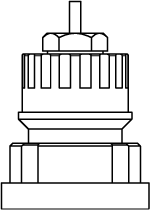 Before using, the sensor must be paired with the thermostatic head. One thermostatic head can be paired with only one sensor, but one sensor can be paired with up to three thermostatic heads. FGBRS-001 is the only compatible temperature sensor. Release the button when you see blue LED colour. Click the button to confirm the selection, the LED ring will start blinking blue. Within 1 minute click button on the sensor. 5 times red – sensor not paired. Place the sensor in same room as head, no further than 5 meters from it. Press and hold the button on the sensor for 2 seconds. The LED on the sensor will blink 3 times to confirm unpairing. 1. Log in to Home Center. 2. Go to the Plugins tab. 3. Search for the Thermostat & Heating Zone plugin and open it. 4. 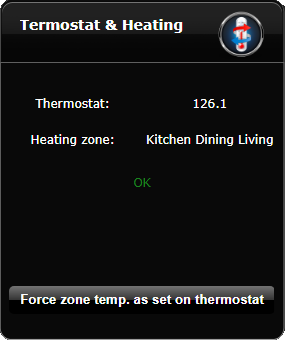 Go to the Advanced tab and choose one of the thermostats and the heating zone. Chosen Heating Zone should contain many thermostats. 6. Save changes by clicking Floppy disc icon on the right sidebar. 7. Set temperature manually (on the chosen thermostat). 8. Go back to the General tab and click the Force zone temp. as set on thermostat button. Now all thermostats in this Heating Zone will follow the main thermostat. You can set temperature using app (10-30°C) or directly on the device (16-24°C). During manual temperature change LED ring colour corresponds to the temperature set-point. Bring your hand close to the sphere. Pulse quickly if device is in override schedule mode. Turn the sphere counter-clockwise to lower temperature or turn clockwise to raise the temperature. Remove the hand from the sphere, after 5 seconds LED will fade and new temperature will be set. If device is currently during normal schedule, setting temperature manually will set Override Schedule. 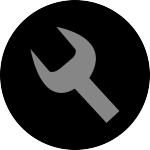 Menu allows to perform important configuration and maintenance actions. After enabling the local protection changing temperature directly on the device (by turning it) will not be possible. Enabling local protection is recommended if you want to prevent accidental temperature change, e.g. by children. The LED ring will blink red 3 times. To change the temperature use the app or disable the local protection. Release the button when you see red LED colour. In Standby Mode the device is in deep sleep state allowing safe dismounting, transporting and low as possible battery consumption. The device is shipped in Standby Mode. Entering the device in Standby Mode will not factory reset the device nor will result in loosing any data. To exit Standby Mode click the button once, the device will enter first installation procedure. Reset procedure allows to restore the heat controller back to its factory settings, which means all information about the network and user configuration will be deleted. Resetting the device is not the recommended way of removing the device from the Z-Wave network. Use the reset procedure only if the primary controller is missing or inoperable. Release the button when you see yellow LED colour. After finishing resetting the device will be put in Standby Mode. Click the button to activate it again. The device is equipped with a rechargeable lithium-polymer battery pack that can be charged via micro-USB port using standard 5V charger (not included). When battery is low the LED ring will start to blink red. The device will also report low battery status of itself and dedicated temperature sensor (if paired) to the controller. Make sure you are using certified charger Class II, which complies with parameters specified in the manual. Do not leave the device unattended while charging. Do not use cables longer than 3 meters for charging the device. Connect charger to the micro-USB port. During charging the LED ring will pulse red and valve control will be disabled. When LED starts pulsing green, disconnect the charger. The device will restore its previous operation. The device allows to create multiple heating schedules to manage temperature in the room throughout the week. Schedules are created via controller interface or app. Schedules allow to set target temperature, fully open the valve or fully close the valve. MANUFACTURER SPECIFIC for valve fully opened. Override Schedule is a special type schedule that has the highest priority; thus it overrides other schedules. The Override Schedule starts right after setting and lasts for specified time, then it is removed and current schedule or normal operation is restored. By turning the knob, while normal schedule is active. The LED ring will pulse with selected adjustment. Via controller, by creating schedule with ID set 255, start time set to NOW and duration (in minutes/hours/days). To exit Override Mode grab knob with your hand for 5 seconds. The device allows to customize its operation to user’s needs. The settings are available in the FIBARO interface as simple options that may be chosen by selecting the appropriate box. This parameter determines duration of Override Schedule after turning the knob while normal schedule is active. This parameter allows to enable different additional functions of the device. Parameter 2 values may be combined, e.g. 1+8=9 means that Open Window Detector and LED indications when controlling remotely are enabled. This parameter allows to check statuses of different additional functions. Parameter 3 values may be combined, e.g. 1+2=3 means optional sensor works properly and open window detection was triggered. 1. What is the FIBARO Heat Controller? The FIBARO Heat Controller is a Z-Wave compatible, remotely controlled thermostatic head to control the temperature in your room. 2. How can I use FIBARO Heat Controller? 3. Can I use The FIBARO Heat Controller directly with electric heater/furnace? The FIBARO Heat Controller works only with radiators with M30 x 1.5m, Danfoss RTD-N, and Danfoss RA-N (with adapter) valves. 4. What happens after my battery runs out? 5. Which kind of valves support The FIBARO Heat Controller? It supports M30 x 1.5 type and Danfoss RTD-N and Danfoss RA-N (using adapters). Important: the valve must now be installed horizontally. 6. Can I use the extra temperature sensor in scenes without the participation of The Heat Controller? No – Extra Temperature Sensor works only with FIBARO Heat Controller. 7. What kind of battery is used in the device? Thermostat FG(BH)T-001 has a built-in battery (lithium-ion cell) that is not replaceable. The declared lifetime of the battery is 300 charging cycles. It takes about 4 hours to fully charge the battery. It is necessary to use a USB charger with a power of at least 2,5W (500mA). The sensor is powered by a CR2032 lithium battery. 8. How to properly charge the battery? It is recommended to fully charge the battery before installing The Heat Controller on the thermostatic valve. It is recommended to charge the battery before the start of the heating season and after the end of the heating season. If possible, it is recommended to remove the head for the charging process. The device memorizes the last valve setting while the battery is charging. The device does not regulate the temperature during the charging process. The device may inaccurately regulate the temperature for an hour after the end of charging. 9. What is the estimated working time of the device? Using an extra temperature sensor: 10 months (error rate + – 25%). Without an extra temperature sensor: 11 months (error rate + – 25%). 10. How long does the calibration take? Typically, the calibration process takes about 30 seconds. 11. What type of heating is recommended for using with the Heat Controller? The best heating type to be controlled by the FIBARO Heat Controller is the one that holds the most constant temperature or slowly fluctuates. Hence, the Heat Controller can act accordingly. With more significant temperature changes, the Heat Controller may underheat or overheat the rooms. 12. How to install an extra temperature sensor to make it work the most efficient? It is recommended to place the temperature sensor at a short distance from the radiator. It is best for the sensor to “see” the radiator. It should be noted, however, that the temperature is regulated at the point where the sensor is located. The position of the sensor should be selected experimentally. You can place the sensor one meter from the radiator and verify for a few days the quality of adjustment, then increase the distance, for example, one meter, etc., until you get satisfying results. Do not place the sensor where it can be touched by people and animals or other objects that may heat or cool it and distort results. Do not place the temperature sensor in the places where drafts are present. Do not cover the temperature sensor with anything. It should be kept in mind that the room temperature is not evenly distributed. Apart from the influence of other factors, for example, other heat sources (fireplace, fan heater) or drafts, the temperature also depends on the height above the floor level. The difference between the temperature at the floor and the ceiling can reach up to 3 degrees of Celsius. Keep this in mind when choosing a location for your external sensor. 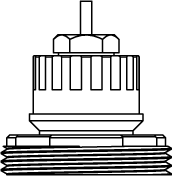 Place the device on non-metallic surfaces. Heating system management is a process which can be influenced by many factors.